In 1997, when the town of Ridway applied for its first grant to restore the Uncompahgre River in town limits, a group of visionaries imagined the area becoming a river recreation attraction for the community. Little did they know that the restored length of river and the 11-acre park on its west bank would become the site of a major watershed celebration, attracting about 500 people each year for 10-plus years. The town is celebrating the 10th annual Ridgway RiverFest, a free community festival at Rollans Park (next to the Highway 62 bridge), on Saturday, June 24. The first riverside celebration was organized by the town government in July 2003 when a Great Outdoors Colorado grant was awarded to the town for major river restoration. But, the official Ridgway River Festival was started by a local nonprofit, the Mosaic Community Project, in 2008. The nonprofit was formed by local mothers hoping to establish a charter elementary school in Ridgway. Though they were unsuccessful, they had lots of energy and wanted to give back to the community so they raised funds through various events and awarded grants to service projects proposed by local students. The group funded the installation of a bench by local artist Lisa Issenberg next to the river, and a bike rack by Jeff Skoloda by the pedestrian bridge in Rollans Park. The river festival became its signature event from 2008 to 2013. In addition to a watershed education area and nonprofit booths, the festivals featured live music, food vendors, Colorado beers and margaritas, including frozen ones created by Glenda the Blenda bike. The bike had been created by the Mosaic Community Project as a way of raising funds at local events. Since 2008 until today, the festival has also featured on-river activities and races including hard shell and inflatable boats as well as standup paddleboards. The highlight is the “Junk of the Unc” where competitors race on home-made river-crafts made of all kinds of repurposed materials. In 2011, the Uncompahgre Watershed Partnership, a local group that aims to protect and restore local water resources through collaborative projects, joined in the festival organization. 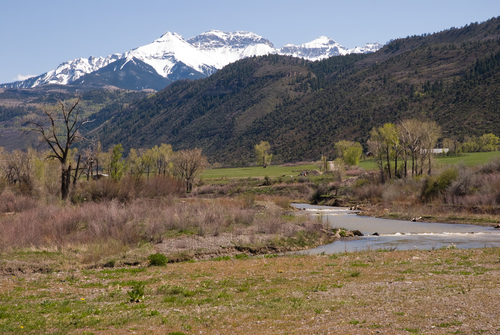 The group was created in 2007 to bring stakeholders together to monitor and improve the water quality in the Uncompahgre River and surrounding watershed, and became a nonprofit in 2013. The partnership took over the organization of the entire festival in 2014. About half the proceeds from sponsorships, silent auction purchases and drink sales at the festival pay for the entertainment and other expenses, and the other half of the proceeds funds future water monitoring, mine remediation and other related projects. Part-time staff and volunteer board members have kept it going by enlisting the support of dozens of volunteers and nearly a hundred sponsors each year. Ouray Mountain Rescue Team and local resident Chris Haaland have kept the river races going every year and still volunteer their time to ensure the river activities are safe and fun. While the same popular festival activities like live music from bluesman Kipori Woods and friends are repeated each year, some special additions have been made to the 10th annual event. The silent auction area, which was initiated a few years ago, has been dubbed the River Rat Marketplace and will offer more great deals than ever on donated products, services and certificates from nearly 50 companies. A Ute flute player will join Ute elder Roland McCook to share their traditional culture. Youth areas will include a River Fairy Forest with four activity stations and a bug science demonstration. Plus, a commemorative mural will be colored by the community, and drinks will be served in reusable, collectible festival cups. The 10th Annual Ridgway RiverFest will be Saturday, June 24, from 10 a.m. to 6 p.m. For the festival schedule and information, visit http://ridgwayriverfest.org.